The following sections describe the various menu and toolbar options in Visual MODFLOW Flex. The File menu provides access to standard operations such as open, save, save as, and close project. The file Menu can also be used to import data from external sources and modify project settings. You will find the last few models you have opened so you can quickly re-open them. New Project <CTRL+N>: Opens the create new project setup dialog. Open Project <CRTL+O>: Opens an existing project. Note: only one project can be open in Flex at a time. Import Project <CTRL+I>: Imports a Visual MODFLOW Classic (*.vmf) file. Save Project <CTRL+S>: Saves the active project to its current location. Save Project As <F12>: Saves the active project in a selected location. Project Settings: Opens the Project Settings dialog, which stores model setup and project meta-data information: including model default values, units and coordinate system. Import Data <CRTL-D>: Opens the Import Data dialog to add external data to your project. Recent Project List: A list of the most recently saved projects will be shown. Selecting any of the projects in the list will close any active project (upon user confirmation) and open the selected project. Exit <Alt+F4>: Exits Flex - you will be prompted to save your project if one is open. The View menu allows you to turn on or off the Data and Model Explorer <F11> and the Workflow tree <F4>. Preferences: allows you to adjust the preferences for 3D Viewers and for Flex in general. By default, Visual MODFLOW Flex will attempt to use the vendor-provided driver included with your graphics acceleration hardware. If problems are encountered with the vendor provided drivers, e.g., poor on-screen display/performance, then Visual MODFLOW Flex provides the option to use the Microsoft Driver for OpenGL. By default, Visual MODFLOW Flex will attempt to use the vendor provided driver included with your graphics acceleration hardware. If problems are encountered with the vendor provided drivers, e.g., poor on-screen display/performance, Visual MODFLOW Flex provides the option to use the Microsoft Driver for OpenGL. Depending on the size of your model, Visual MODFLOW Flex may run very slowly during rotations or when 3D Numerical Gridded data objects are moved in the 3D Viewer (eg. MODFLOW Heads, Drawdown, Properties, or Transport Concentrations). In this situation, the virtual data grid option may be used to increase the speed of the data processing and image rendering. It can be used to set up a uniformly spaced grid with a specified number of rows and columns. The virtual data grid option will interpolate the data from the model to the uniformly spaced virtual grid. This allows a smaller amount of information to be processed much faster. However, this also results in a loss of resolution of the data, and some local scale minimum and maximum values may be missed. If you are experiencing performance issues, try choosing the "Low" option. The number presented in parentheses is the number of cells used along the X and Y axis for the virtual data grid. This parameter controls the visualization quality and speed of surface data objects for the 3D viewer. This parameter can be used when you want to display surfaces with a large grid size (eg. 500 x 500 or greater). Similar to the Virtual Data Grid option above, Surfaces will be re-sampled to the defined grid size (where the number in parentheses represents the uniform number of rows/columns). The Surface Visualization Quality parameter will affect 3D visualization only; the resolution of the surface data object will not be adjusted, and will be honored when using this surface for Horizons or Property values in a numerical model. Horizon quality is defined by quality of surface used for horizon. The maximum grid size for horizons is 1,000 rows x 1,000 columns. In the case where you select a Surface that has a higher resolution than 1,000 x 1,000, Visual MODFLOW Flex will coarsen that surface to a maximum horizon quality of 1,000 x 1,000. This grid size can be increased; however there will be a performance loss when doing a Conceptual to Numerical conversion and 3D visualization of Horizons and Conceptual Model structural zones and property zones. For more details, please contact Technical Support. This setting provides two options for displaying points in 3D Viewer: Basic and Advanced. If the Basic option is selected, 3D Viewer will render the point shapes in the 3D Viewer. On some computers this option may hinder the performance of the 3D Viewer. If the Advanced option is selected, 3D Viewer will use bitmap images to display the points. If you are experiencing performance issues display points in 3D Viewer, the Advanced option should be selected. Please Note: The Basic option only supports cube and sphere symbols for displaying points. By default, Visual MODFLOW Flex collects anonymous usage statistics. The data that we collect enables us (Waterloo Hydrogeologic) to get reliable statistics on which features are used (or not used). This helps us better understand the needs of our users so we can build better applications. The information collected is completely anonymous – it is not traceable to any individual, project, or organization. You can opt out by deselecting this option. For more information about our data collection, please see here. Use this option to reset Visual MODFLOW Flex to the factory style settings. Visual MODFLOW Flex provides an option to use Project-wide Color Palettes. This is useful when you have multiple data objects that are rendering the same attribute (eg. heads from different model runs, conductivity distributions), and you want to make qualitative comparisons between these. This is challenging when each data object has its own min and max values and are colored based on this. However, it becomes much easier when these data objects all read from a common color palette. 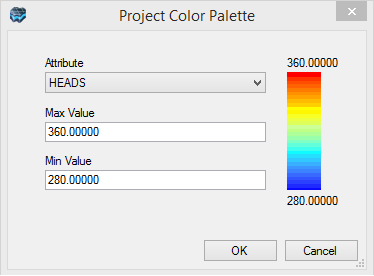 The Project Color Palette settings allow you to set the min/max values for various attributes; these can then be used for various data objects and viewers throughout the project. To enable the Project Color Palette option for a specific data object, this must be enabled in the Color by Attribute page; see Color by Attribute for more details. Allows you to create a new Numerical Model workflow or Conceptual Model workflow or open existing workflows. When you select the appropriate item, the associated workflow window will load. Allows you to creates a new 2D, 3D, or time series viewer of the active data object selected in the Data Viewer/Model Explorer or reset the active view to the default extents. Provides links to help topics, webhelp, and online resources. The Just-In-Time Help will display a small help panel below most steps in the workflow window. Checks for Updates: calls out to Waterloo Hydrogeologic's webpage to see if updates are available. Show Error Log: opens the Visual MODFLOW error log, which can be useful in helping technical support diagnose and pinpoint problems, if they arise. Show System Information: opens a text file with system configuration information, which can be useful in helping technical support diagnose problems, if they arise. About... launches the About Screen, which shows the version and build you are using along with your registration details (name, company, serial number). Licensing Help will load the online help for working with licensing. For more details on licensing, please refer to the Getting Started Guide.